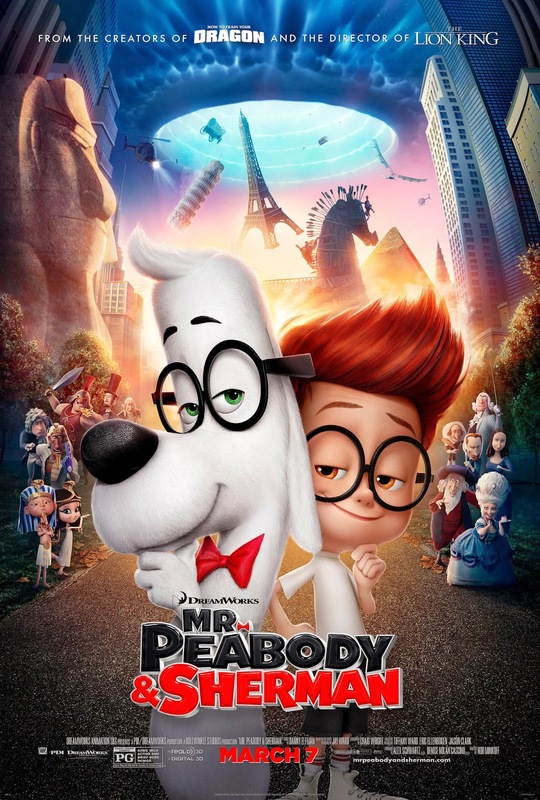 Let's just be up front about this whole Mr. Peabody and Sherman thing: it's a little weird. I mean, the whole concept and everything is a little out there when it comes to typical, safe family entertainment in that it's just straight-up odd to think about what is typically considered a pet adopting what typically takes care of said pet. That said, I'm not familiar with the original series that apparently ran as part of the Rocky & Bullwinkle universe and really had no idea of what type of story I was getting myself into or what adventure I was going to be taken on as I hadn't paid much attention to the marketing for the film, but as Dreamworks originals tend to go I expected to at least have a nice, colorful and randomly funny entertaining time if not receiving the deeper, more introspective character moments and more honest themes that come along with what we have become accustomed to with Pixar. Many people will disagree and say that Pixar has been slipping lately and I won't argue with you when it comes to defending the Cars series, but I enjoyed both Brave and Monsters University to a point that Mr. Peabody & Sherman can't even touch. Of course, this is really like trying to compare a January release to an Oscar-bait film as it seems Dreamworks productions have both lower standards and naturally a lower set of expectations for their final product than that of the major summer tentpoles Pixar is akin to putting out. Still, it is hard to discern the difference in the two when they exist in the same genre and are targeted (mainly) at the same audiences, but it is only when the first offering does well and/or have the right people behind it to truly invest and push it to something more, something deeper that we get the eventual sequels with a more pristine release date a la How to Train Your Dragon (we all saw how Turbo turned out last year when they through a non-franchise, non-re-make in the throws of summer). With Mr. Peabody & Sherman the studio has concocted what is essentially an extended TV episode and it feels this way without me, again, never having seen the original show. It is fine that it is episodic though because it is so brief of an experience that instead of coming away feeling short-changed, we feel satisfied with the amount of adventure packed into these pint-sized characters. Penny (Ariel Winter). 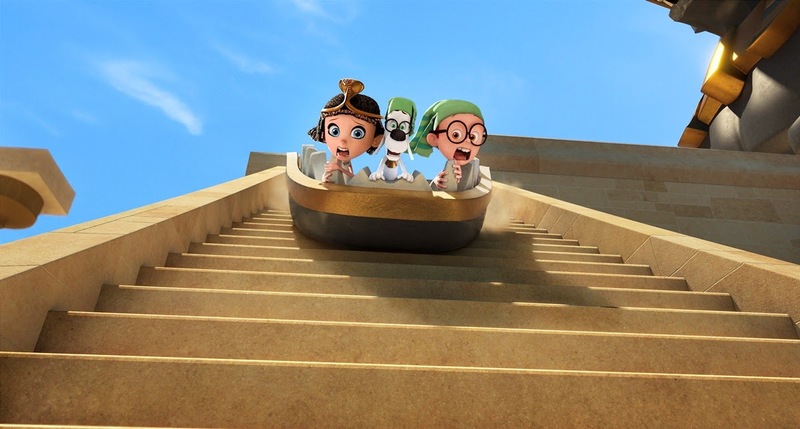 Mr. Peabody (Ty Burrell) and Sherman (Max Charles) venture into ancient Egypt. In many ways, Mr. Peabody & Sherman is a throwback to the days of old (at least for me as I haven't watched many shows aimed at toddlers and youngins lately) where the titular characters walk onto the screen and begin addressing the audience, breaking the fourth wall, fully aware that we are going along on this adventure with them and yes, that they are indeed going on an adventure. There is no other way of life for Mr. Peabody (Ty Burell) a genius dog who was never adopted as a puppy and so instead of being somebody's pet decided to go to school, get countless degrees (Valedogtorian at all, of course) and as far as he is concerned, helped make mankind all the better with them (though I'm sure many would be upset with him about inventing auto tune). In the process of growing up, learning, becoming an innovator and an expert in every field imaginable he also had time to adopt a young boy, Sherman (Max Charles), as he shared the feelings of abandonment and never having a home with the young boy. He was able to prove to a judge (with the vocal power of Dennis Haysbert) that he was fit to be a parent to a human boy and so he was inspired to create his greatest invention ever, the WABAC (or way back) which is nothing less than a time machine. The two bounce around the space time continuum going from meeting George Washington to Marie Antoinette all in order for Mr. Peabody to teach Sherman not only history lessons, but lessons about life and to expand his cultural mind that allows him to see the bigger picture when his teacher on the first day of school asks about Mr. Washington chopping down the cherry tree and Sherman is able to call it out as an apocryphal. This diversion of widely accepted knowledge irritates Penny Peterson (Ariel Winter) to the point she picks a fight with Sherman and blames his aggressive actions toward her on him having been brought up by a dog. Ms. Grunion (the always reliable Allison Janney) shows up from the bureau of Child Safety and Protection and threatens to take Sherman away from Mr. Peabody resulting in the genius canine trying to impress both Penny's parents (Leslie Mann and Stephen Colbert) as well as the Grunion while Sherman can't help but introduce Penny to the WABAC where they get in a little more trouble than they bargained for. There is a bit of a montage after Mr. Peabody is informed by the schools principal and Ms. Grunion that she will be visiting his house later that night for an inspection of what type of environment the boy is being raised in and this montage only echoes what I said in the first sentence of the review: there is just something a little off about the main idea. The song playing in the background as the alternate animation of the montage flashes across the screen showing us the times Mr. Peabody and Sherman have shared together as they've traveled through time while assisting the likes of Benjamin Franklin and Pablo Picasso is oddly touching in that it's refrain goes something like, "Beautiful, beautiful, beautiful...beautiful boy." It is meant to elicit a deep affection for Sherman from Mr. Peabody after the day they've had, but paired with the images of them running through fields and this grown dog with glasses toting around a human baby it instead just seems a little, well, weird. I couldn't shake it and though it didn't totally ruin my experience of the film (after all, it is a childrens movie and I get that) it still couldn't prevent from thinking that they could have gone about this in a completely different way. Again, I realize this is based on a cartoon from the fifties and sixties and that the storyline of Mr. Peabody finding Sherman an ally and finding out he was an orphan and adopting him was all a part of the mythology that, if changed, would have warranted Dreamworks go ahead and change the names as well, but it simply didn't translate as successfully as I think it was intended to. This doesn't mean it throws off the entire mojo of the movie, but the fact it is this arrangement that ignites the entire point of conflict for the film only draws more attention to it and makes it all the more strange to the adults in the audience. Why Mr. Peabody and Sherman couldn't have simply come up against a fellow classmate who figured out the WABAC existed and in using it behind our titular characters backs got themselves into a mess only our heroes could rescue them from. This might sound a little more generic, but would have essentially created all the same opportunities for what the film accomplished here without drawing attention to its glaring awkwardness. It seems the creators thought this aspect of their story was the difference between it and your standard troubles that come along with time machine plots though and so I applaud them for trying to do something a little off the beaten path but even I, someone who typically has no problem accepting where the filmmaker wants to take me, had to admit I was a little thrown off by this predicament. Sherman and Penny develop their relationship from a place of conflict to one of something richer. That one large complaint out of the way I otherwise enjoyed Mr. Peabody & Sherman for what it is. The quality of the animation coming from Dreamworks is consistently improving even if the inventiveness of it is somewhat lacking; that is the best you guys could come up with for a modernized WABAC? C'mon! The jokes, like that of last falls superior Cloudy with a Chance of Meatballs 2 are full of puns and intelligent talk coming from the mouth of a dog while Sherman is only given a recurring joke that is flat from the moment it tries to take-off (I seriously only heard people laughing quietly at it because they felt they were supposed to). The voice cast is all well and good while no one does anything particularly amusing. By virtue of the fact it is Stephen Colbert as Mr. Peterson I wish we'd seen more of his and Leslie Mann's characters and as I don't watch Modern Family I have little to go off as far as how much Burrell is stretching himself here. I'm sure after seeing him play it up in this weekends Muppets: Most Wanted I may have a better idea, but he delivers his puns and complex language with an air of sophistication and humor so I imagine we can just be thankful it comes off genuine as, again, it is coming from the mouth of a dog. The nice surprise is the young voice cast, especially Charles and Winter, who allow the developing relationship between Sherman and Penny to become something entirely cute within itself while not becoming a main point of focus or taking away from the main plot. What this strand does allow the story to do though is show the development of Sherman from a young boy into a young man. He is beginning to break away from his father and the film makes it evident Mr. Peabody is as ready for this change as Sherman is to like girls, but they are both happening. While the film doesn't take a stance on an absolute way it thinks you should raise children, it does serve as a nice metaphorical situation that displays how no one method is correct or that coming down hard on either side of the line is never going to work as well as simply allowing yourself to grow with your children and adapting your teaching style to the their interests and development pace. 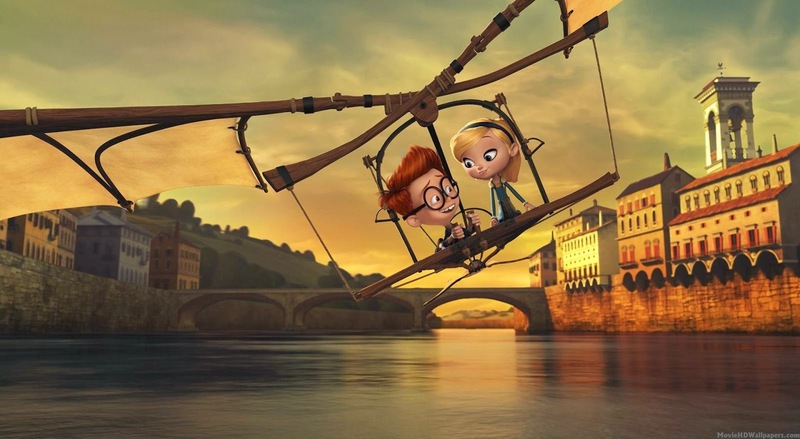 It is also a plus that the kids in the audience will learn a lot of history and notable names from going on this adventure with Mr. Peabody and Sherman. It is a fun, harmless movie that I enjoyed and would certainly be more than willing to show my own one day, but do I have a deep regard for it? No.